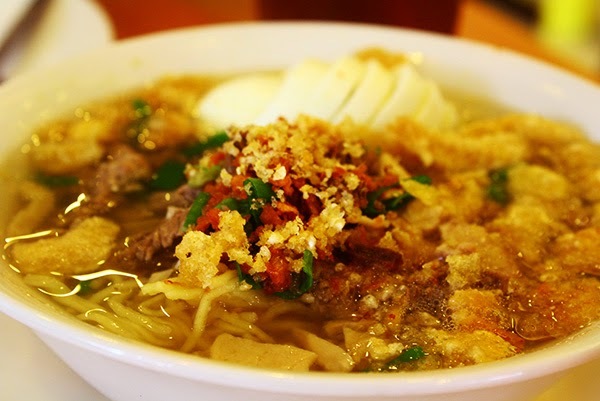 Bachoy is the quintessential Iloilo dish,said to have originated in the market of La Paz, Iloilo by a butcher named Deco, who wanted to make use of the less popular, inexpensive cuts of meat. Thus the original recipe contained pork liver, pancreas, heart, stomach, tripe, spleen and kidney. Today's more modern version eliminates some of these butcher trimmings but a good, rich broth is still a must. 1. In a deep pot, place pork ribs, water and onion. Heat to boiling then reduce to simmer for 30 minutes. Skim off any scum or impurities that rise to the surface of the simmering broth. Strain the liquid into a bowl and set aside. 2. Meanwhile heat 1/4 cup of the cooking oil in another gan. Add the pork meats and fry until golden. Stir in chicken gizzards and heat through. Set aside. 3. In a deep pot heat remaining cooking oil. Saute garlic until golden. Scoop out about 6 teaspoons of the fried garlic and set aside for garnish. 4. In the same pot with remaining garlic, saute onions and ginger around 3 minutes. Stir in fried meats. Season with patis; mix well. 5. Pour in reserved pork stock and broth cubes. Let boil then simmer about 8 minutes. Add salt and pepper to taste. 6. In 6 individual bowls arrange drained miki noodles. Ladle into each bowl the prepared broth and cooked meats. Garnish with spring onions, chicharon, sliced eggs and fried garlic. Serve hot with puto manapla or biscocho.